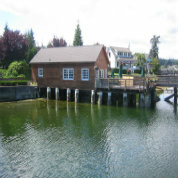 DNR Aquatics manages leases for activities that occur on state owned aquatic lands for freshwater and saltwater water bodies throughout the state of Washington. DNR is responsible for ensuring commercial, recreational and habitat can continue for future generations. The following are examples of how AAMT provides scientific and technical support to leasing decisions to ensure that DNR aquatics staff are applying stewardship principles to leases in a way that allows for the sustainability of aquatic resources. DNR Aquatics staff develop policy that guides management decisions on state owned aquatic lands. 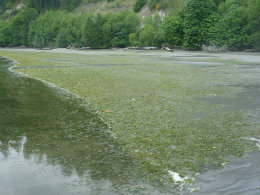 One goal of agency policy is to minimize and avoid impacts to the nearshore ecosystem such as eelgrass (Zostera marina); various fish species; and benthic organisms. Certain activities that occur on state owned aquatic lands require further research and evaluation to determine if policy should be updated or created to better reflect what current science tells us. Science and policy staff have worked together to develop, research, and evaluate the following topics so land managers can implement policy with greater confidence. Limiting impacts to eelgrass throughout Washington’s nearshore environment is a consistent objective for DNR aquatics staff. This can be a complicated goal to reach since eelgrass plants and eelgrass beds are in constant fluctuation. More specifically, the edge of an eelgrass area is not static and evaluating the area in need of protection from impacts can be challenging to determine. AAMT has been working to ascertain eelgrass edge dynamics through workgroups, research and monitoring for over three years to help determine the space eelgrass needs to thrive. Follow this link for a map of eelgrass edge sites. Click here for more information. For more details regarding this research, visit our publications website. 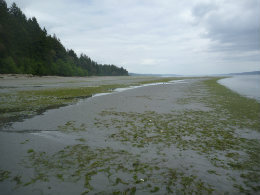 Light availability is considered by many eelgrass experts to be a limiting factor in the successful growth and survival of eelgrass throughout Washington waters. Light can be less available in the water column due to environmental conditions such as the types and amount of particles in the water, the amount of salinity, and the amount of plankton and chlorophyll. Shading by anthropogenic structures is considered to have impacts on eelgrass growth, fish behavior and benthic organism distribution. 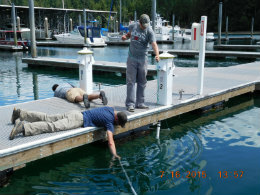 To adequately address management questions concerning the impacts light availability and shading have on the nearshore, AAMT designed experiments using conditions, environments, and structures that typically occur on state owned aquatic lands. The following are topics AAMT has provided science and technical support for to address questions regarding light availability in the nearshore. Can environmental DNA (eDNA) sediment sampling be used as a detection method for lamprey? How does eDNA sediment analysis compare to other methodologies used to identify the presence of lamprey larvae? How do river bedland changes alter spawning and rearing habitat for lamprey? 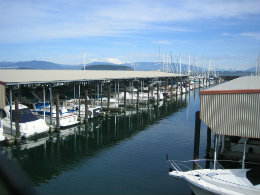 Climate change impacts are being observed on a global scale and climate change is expected to impact Washington state aquatic resources in various ways. Rising sea levels have been recorded throughout the state and will alter the nearshore environment such as habitat and species distribution, light availability, erosion and sedimentation rates, and more. 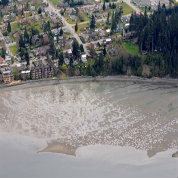 The salt water chemistry of our local waters is being altered because of climate change. Our ocean influenced water bodies are becoming more acidic which can be detrimental to various aquatic resources of the state. AAMT has pinpointed two topics important to DNR Aquatic management of state owned aquatic lands. AAMT is actively researching, monitoring, and evaluating data for ocean acidification research and tidal inundation modeling. Are shellfish larvae abundant in eelgrass habitat? Can eelgrass photosynthesis counteract ocean acidification? 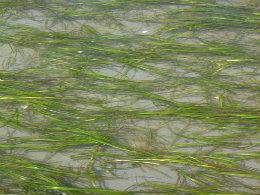 Can eelgrass enhance shellfish growth and reduce stress from the environment? 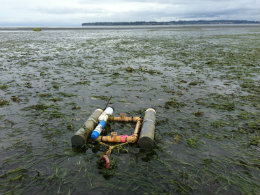 Can eelgrass improve shellfish growth and pH in a halo around the meadow? 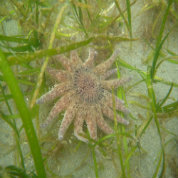 Please also view our Anemone sites volunteer locations. For more details regarding this research, visit the following link to view a presentation by AAMT. 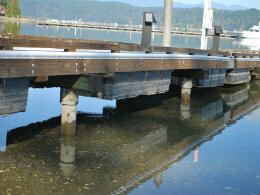 Rising sea levels have been recorded and are expected to occur with climate change. 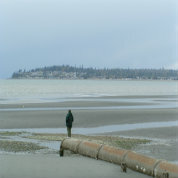 This means a change in water inundation for the Puget Sound nearshore and its connected water bodies. Native eelgrass is a valuable resource to Washington state and DNR Aquatic staff are evaluating what impacts rising sea levels will have on the nearshore distribution of native and non-native eelgrass. AAMT has partnered with Central Washington University to evaluate tidal inundation impacts to eelgrass habitat in the nearshore. Click here for additional information. DNR manages state-owned aquatic resources in the nearshore. Many questions arise regarding species use and function within various nearshore habitats. Additionally, anthropogenic impacts to those habitats are a concern. 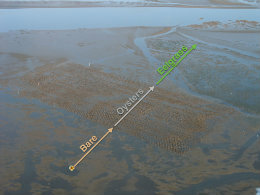 AAMT has attempted to answer some pressing questions regarding the species that utilize the nearshore ecosystem by looking closely at specific food web and habitat use dynamics such as burrowing shrimp and gray whales, burrowing shrimp and green sturgeon and mesopredator use of eelgrass habitat. DNR is challenged with determining if the commercial harvest of burrowing shrimp (Neotrypaea californiensis) is affecting the yearly feeding on these shrimp by the spring resident population of Gray Whale (Eschrichtius robustus) in Puget Sound’s Whidbey Basin. Click here to read more on how AAMT has sought to answer this question. 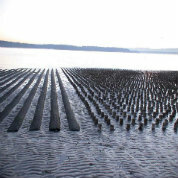 In Willapa Bay, shellfish growers have been trying to improve conditions for clam farming by actively applying coarser substrate (such as gravel and pebbles) and pesticides (such as Carbaryl and Imidacloprid) to reduce burrowing shrimp numbers. This has raised concerns regarding the affects burrowing shrimp population control may have on the food supply for green sturgeon. AAMT set out to understand if the methods used to reduce burrowing shrimp numbers are affecting the yearly feeding of these shrimp by the green sturgeon. Click here to see how AAMT has sought to answer this question. 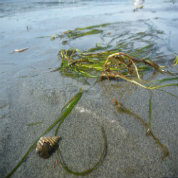 Eelgrass (Zostera marina) habitat plays a key role in the nearshore ecosystem in Washington state. DNR Aquatics has focused many resources on protecting this important habitat type. To gain a better understanding of eelgrass habitat, AAMT set up a series of monitoring stations to obtain information on how mesopredators function within the nearshore ecosystem. Read here to see how AAMT has sought to answer this question. Mussel raft waste includes feces and pseudofeces from floating shellfish aquaculture which could effect changes in the sediment below the raft including organic content, total organic carbon, dissolved oxygen, sediment redox potential, and increased sulfides and ammonium. IMTA relies on use of the natural food chain to mitigate waste from open aquaculture systems. It is based on the ecosystem concept that a species always consumes waste generated by another. Click here to read more on how AAMT is investigating the effectiveness of mitigating waste from mussel rafts using a multi trophic approach.